This post has little to do with R directly, but links to the problem of doing reproducible, Scalable Earth Observation analytics with open source software, and to the problem whether rasdaman should become an OSGeo project. I posted it to the OSGeo-discuss mailing list, as there the issue of rasdaman incubation was heavily discussed. The discussion focused mainly on the provenance of rasdaman open source, but I tried to take a step back. What follows is my original post, but with links added in-line. As a scientist, I teach my students that for doing science it is a requirement to work with open source software, because only then workflows are fully transparent and can be reproduced by other scientists without prohibitive license costs. Currently, working with large amounts of earth observation (EO) or climate model data typically requires to download these data tile by tile, stitch them together, and go through all of them. Array databases may simplify this substantially: after ingesting the tiles, they can directly work on the whole data as a multi-dimensinal array (“data cube”). Computations on these array are typically embarassingly parallel, and scale up with the number of cores in a cluster. Rasdaman is an array data base that comes in two flavours, the open source community edition (CE) and the commercial enterprise edition (EE). The differences between the two are clear. When I want to use rasdaman CE (open source) for scalable image analysis, I get stuck waiting for one core to finish everything. This is not going to solve any problems related to computing on large data, and is not scalable. The bold claim that rasdaman.org opens with (“This worldwide leading array analytics engine distinguishes itself by its flexibility, performance, and scalability”) is not true for the CE advertised. This has been mentioned in the past on mailing lists (here and here), but the typical answer from Peter Baumann diverts into other arguments. 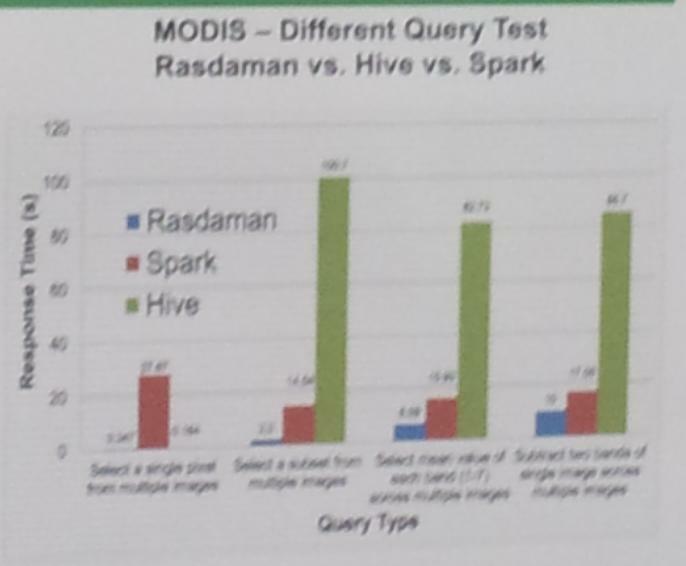 Also the benchmark graph (photo from an AGU poster) that Peter sent this week must refer to the enterprise edition, since Spark and Hive both scale, but rasdaman CE does not. I assume that on the discussions on OSGeo-discuss, ONLY the open source community edition is considered, compared, and discussed, as a potential future OSGeo project. OSGeo supports the needs of the open source geospatial community. I wonder whether OSGeo should recommend rasdaman CE to the open source geospatial community.